Pita chips are one of my favorite crunchy snacks, crisp and full of flavor. I’ve spent more money than I care to admit on buying them, so decided it was time to make them at home. Making pita chips is easy and economical, the perfect quick snack which also work well to impress friends at a dinner party. Yesterday, I came across a stray half-empty bag of pita bread in the back of the refrigerator. I contemplated how long the bag must have set there and couldn’t begin to imagine just how long it had been. Fortunately, due to the magic of preservatives, I didn’t see a speck of green or anything fuzzy. In my book, this means it’s fair game to use! Fearing the pita bread would suddenly combust, I immediately put it to use. Crispy, crunchy pita chips seemed like the best, no fuss option. 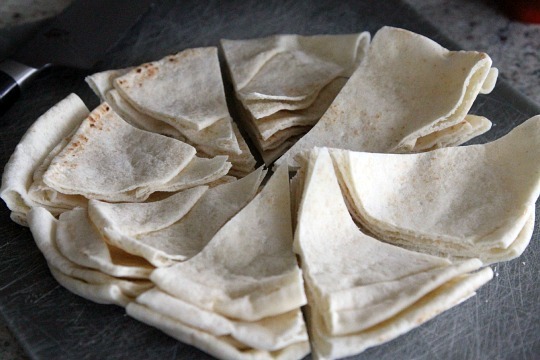 Stack the four pitas and cut into quarters, then cut each quarter in half for a total of 32 triangles in total. You can cut the quarters into thirds if you prefer a smaller chip. Place pita slices a large cookie sheet and spread into an even layer. The chips should not overlap. Pour olive oil over the chips and toss the chips with your fingers to evenly coat every piece, front and back. Next, sprinkle with a pinch of black pepper, and a pinch or two of salt. One more toss with my fingers to get the seasonings all over each piece. You can see there are many possibilities for flavoring — I’m a big garlic fan, so decided that was best for last night. In the past, I’ve tried various seasonings, including dill, red pepper flakes, cumin, chipotle pepper, and a wide range of italian spices. A sprinkle of parmesan isn’t bad either. But, I always return to just garlic. Place into a pre-heated 350F oven and bake for 7 minutes. Then, remove pan and flip each pice, return to oven and bake for an additional 7 minutes. At this point, the pita chips are nearly done so I open the oven door for a few seconds to release its heat and turn off the oven. I close the oven door and let the chips set for another 10 minutes, then remove to finish cooling. 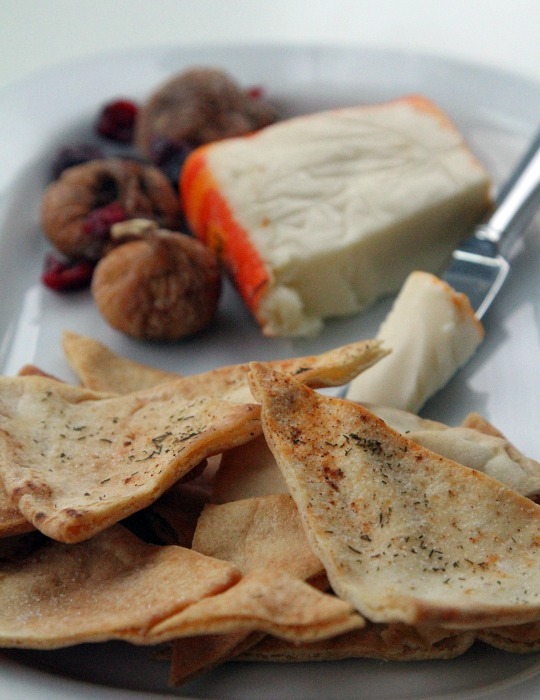 Pita chips are perfect for serving with a soft cheese and dried fruit. And since the pita chips are firm and sturdy, feel free to pair them with your favorite thick dip. I’m love pita chips too!!! Thank for recipe! I get my pita at the nearby Entenmann’s thrift store and freeze just to make pita chips. I actually like mine crisp but still tender on the inside! The addition of dill sounds like a great idea, Manisha! I have a stack of tortillas in the fridge right now that need to be used up. I’ll try the dill and garlic on them.